It’s not unusual to get a little cabin-fever during Yuletide as weather, darkness and social engagements restrict one to indoor activities, but that norm has been compounded for us this Christmas by the arrival of our second child just two weeks ago. As anyone who has had infant children knows, social occasions quickly become hassles, and it’s almost impossible to leave the house with a newborn without first making sure to have milk, diapers, changes of clothing, blankets, pacifiers and assorted other junk on hand, at which point, it will almost certainly start to rain or snow, forcing you to re-wrap the baby in extra layers or throw hands in air and abort plans altogether. We’ve had the immensely good fortune of assorted friends and relations having visited or stayed during Emiliana’s first weeks which has been a huge help but being so housebound has forced us to be rather more imaginative than usual in the preparation of our meals. It’s hardly been a hardship, however: those of you that follow us on Instagram know that the extraordinarily good garlic, rosemary and sage-marinated leg of lamb we roasted over potatoes and turnips on Christmas Day provided most succulent leftovers that we progressively turned into fillings for souvlaki and tacos. What you don’t know is that this inventiveness reached an extraordinary pinnacle on the third day of Christmas with a spectacular Uzbek-style plov, or pilaf. It didn’t occur to me at the time, but, there exists a parallel between Uzbekistan’s geographical situation and our own limited mobility lately in that nation’s distinction as only one of two doubly-landlocked countries in the world. Indeed, mirroring the welcome flood of visitors and gifts arriving on our doorstep since the birth, things and people came to Uzbekistan rather than the other way around. The Silk Road ran through the heart of Uzbek territory and trade provided the means to construct the fabled cities of Samarkand and Bukhara, and enabled the transit and marriage of cultures and cuisines from East and West. Under Russian and then Soviet rule, although in a profoundly different way, programs relocating ethnic groups from around the Empire and USSR brought Russians and Tatars, vodka and ugly concrete architecture. 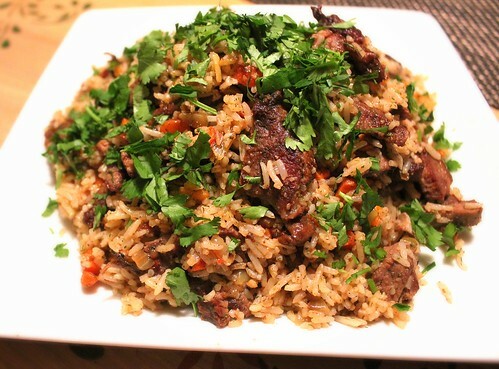 Plov might be the quintessential Central Asian dish in its unique combination of light and starchy, fragrant and stodgy. 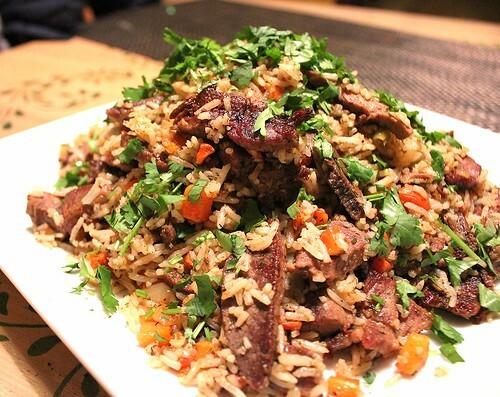 The long grain rice favored by South Asian and Middle Easterners, the hearty meats common to the frigid steppe, the garlic and earthy spices of the Levant and the root vegetables and animal fat loved by Slavic nations. I have eaten no other dish, save perhaps the somewhat similar biryani, that offers so much complexity in one pot. We first ate it one humid summer night at Uzbekistan restaurant in the North-East of Philadelphia. Tucked away down a residential street in an ugly concrete house hung lazily with grape vines cloaked in dust that the shiny wheel-rims of its ostentations Russian-expatriate patrons churned up as they rumbled into the gravel parking-lot, Uzbekistan does a decent job of recreating what I imagine former Soviet republics in the east look like. The interior does too – packed to the rafters with giant, sweaty Russians, chucking down room-temperature vodka and wedged tightly around small tables creaking under platters of flatbread, salads thick with gloopy mayonnaise and fried onions, bright green soups, and smoky grilled skewers under unforgiving incandescent lights. Shown to our table next to a particularly ruddy octet of Russians celebrating a birthday by a sallow young woman who counseled us against ordering more than five plates, we still soon found our table hidden beneath enough food to feed most of Central Asia. Among this remarkable pile of plates, the most delicious was an unfeasible mound of Samarkand-style plov in which tender hunks of lamb redolent of roasted garlic and plump thumbs of carrot spiced with cumin and coriander seed nestled among perfectly-separated grains of rice. Fork load after fork load went down until we slumped back in our chairs and could do no more. Our Russian neighbors were still in riotous mood and smashing their way through a gigantic blue and yellow-iced birthday cake resembling the Tsar’s winter palace when our waitress returned offering us tea and approving nods at our progress. Such was our sleep-derived condition when we remade this dish last week that it was all we could do to trim meat off the bone and boil some rice: the traditional method of preparation was beyond our ken. Nonetheless, a reasonable approximation and a similar post-meal drowsiness was achieved. Purists may be satisfied to note that the lengthier traditional method is also included below. In a large pan over medium heat, brown lamb pieces well in olive oil. Remove and set aside. Then, sweat onions and carrots together in olive oil until soft and fragrant, scraping bottom of pan with wooden spoon occasionally to deglaze meat juices. Add garlic. Cook for another 3 minutes, then add ground/crushed spices salt and pepper. Stir well. Kitchen should be very aromatic at this point. Add rice and stir in. Cook for 30 seconds – 1 minute before adding stock. Bring to a boil for ten minutes. After 10 minutes, cover and reduce heat to very low. After second ten minutes, turn off the heat but leave covered to steam for another ten minutes. Stir rice well and incorporate the lamb back in. Sprinkle with chopped cilantro and serve. As above, except lamb should be uncooked 2 inch (4cm) cubes of lamb shoulder, garlic head should be whole, and carrots should be in 3 inch (6cm) lengths. In a large dutch oven, brown meat in oil over medium heat until well-caramelized on all sides. Add onions and carrots, cook for 3-5 minutes. Add spices, salt and black pepper. Stir well. Pour in rice and stir again. Clear a spot in the middle of the pot and place whole head of garlic. Add stock. Cover and bring to a boil. Place in oven and cook for 45 minutes. Remove from oven and allow to rest/cool at room temperature for 15 minutes before serving. To serve, portion rice and meat out with cloves popped out of the whole head of garlic. I love anything with lamb! Congratulations guys! @Rachel: thanks so much! This may be the last post for a while given what we have going on, but glad to hear from you. Thanks for visiting! Congrats on the new addition… perfect food for cold winters and warm hearts — never heard of the dish but would love to try it one of these days. @Deana: thanks! It is a perfect stick to your arteries type meal – perfect for the Siberian winter weather we’ve been having.